One of the greatest mystics of the fifteenth century; born at Rome, of a noble family, in 1384; died there, 9 March, 1440. Her youthful desire was to enter religion, but at her father's wish she married, at the age of twelve, Lorenzo de' Ponziani. Among her children we know of Battista, who carried on the family name, Evangelista, a child of great gifts (d. 1411), and Agnes (d. 1413). Frances was remarkable for her charity to the poor, and her zeal for souls. She won away many Roman ladies from a life of frivolity, and united them in an association of oblates attached to the White Benedictine monastery of Santa Maria Nuova; later they became the Benedictine Oblate Congregation of Tor di Specchi (25 March, 1433) which was approved by Eugene IV (4 July, 1433). Its members led the life of religious, but without the strict cloister or formal vows, and gave themselves up to prayer and good works. With her husband's consent Frances practiced continency, and advanced in a life of contemplation. Her visions often assumed the form of drama enacted for her by heavenly personages. 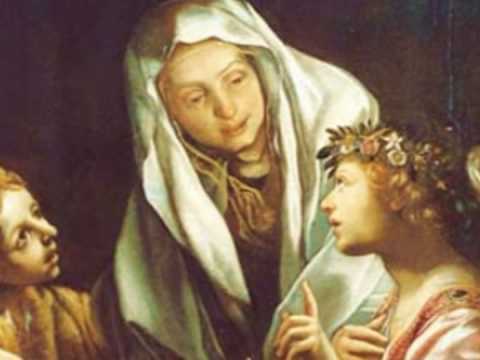 She had the gift of miracles and ecstasy, we well as the bodily vision of her guardian angel, had revelations concerning purgatory and hell, and foretold the ending of the Western Schism. She could read the secrets of consciences and detect plots of diabolical origin. She was remarkable for her humility and detachment, her obedience and patience, exemplified on the occasion ofher husband's banishment, the captivity of Battista, her sons' death, and the loss of all herproperty. On the death of her husband (1436) she retired among her oblates at Tor di Specchi, seeking admission for charity's sake, and was made superior. On the occasion of a visit to her son, she fell ill and died on the day she had foretold. Her canonization was preceded by three processes (1440, 1443, 1451) and Paul V declared her a saint on 9 May, 1608, assigning 9 March as her feast day. Long before that, however, the faithful were wont to venerate her body in the church of Santa Maria Nuova in the Roman Forum, now known as the church of Santa Francesca Romana.